Sh-h-h! 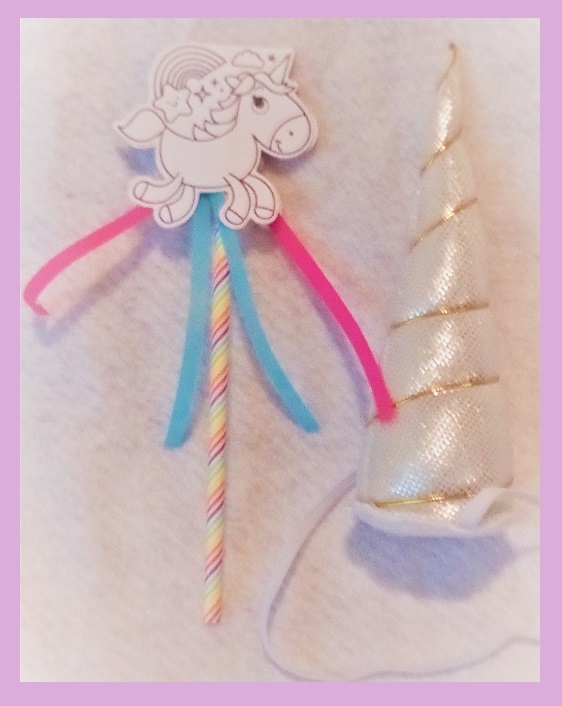 Be sneaky about hiding a plush unicorn horn under your sleeping beauty’s pillow. 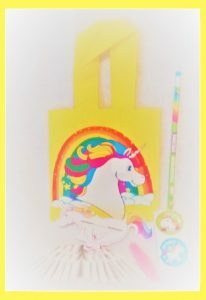 When she awakens from sleep on her birthday tell her to check under her pillow to see if the Unicorn Fairy left her anything. She will rush to the bathroom to look at herself in the mirror. “While you are in there brush your teeth! Add unicorn stickers to the tube of toothpaste. A new Unicorn toothbrush would be awesome as well. 2. Follow the Unicorn Trail Hunting for the Lost Unicorn Horn. While your child is doing her morning bathroom routine, you can blaze the unicorn trail. Some say to drop Skittles on the floor to mark a unicorn trail. .YIKES! I do not favor the idea of encouraging kids to eat candy or poop off of the floor even if it follows the 5-second rule. 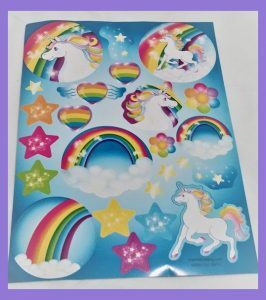 Use stickers to leave the unicorn’s mark. If you leave the sticky side covered your little princess can add them to a sticker collection book. ….but wait! there is more! Jovially sate that you have a special breakfast waiting at the table. 3. 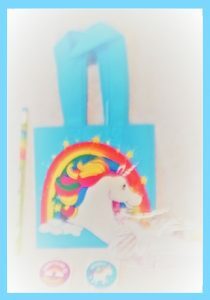 Gather your unicorn clues in a mini tote bag. Have the breakfast table set already. Place a mini tote on a plate and cover with a napkin. Hide the tote with all its magical goodies inside an empty cereal box. If you happen to have an not so favorite kid kind of cereal in the house-all the better! Aren’t these mini totes too cute for words? Your daughter will think so. 4. Flying Unicorns From the ceiling. 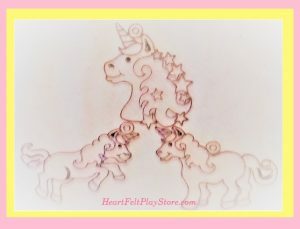 Pre-assemble our Unicorn Glider Craft (as many as you like) near the final destination. Use thread and tacks to dangle from the ceiling. Unicorn Suncatchers to decorate later. …but, wait..ther’s more…go for the door or the curtain…. 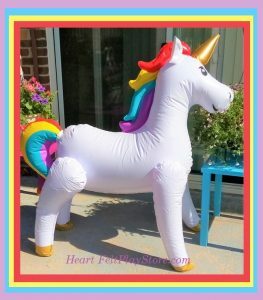 Set up an extra-large Inflatable Unicorn on Your Patio (or any room in your home ) as the BIG SURPRISE! Do you see what I see on my patio? A Unicorn! Click HERE for Heart Felt Play Store’s Extra-large Inflatable Unicorn. Imagine waking up to find a Unicorn on your patio for your birthday! When inflated 1 foot. x 44 inches x 4 feet. For quickest inflation use your bicycle pump. WARNING: Not a flotation device. Not for children under age 3. 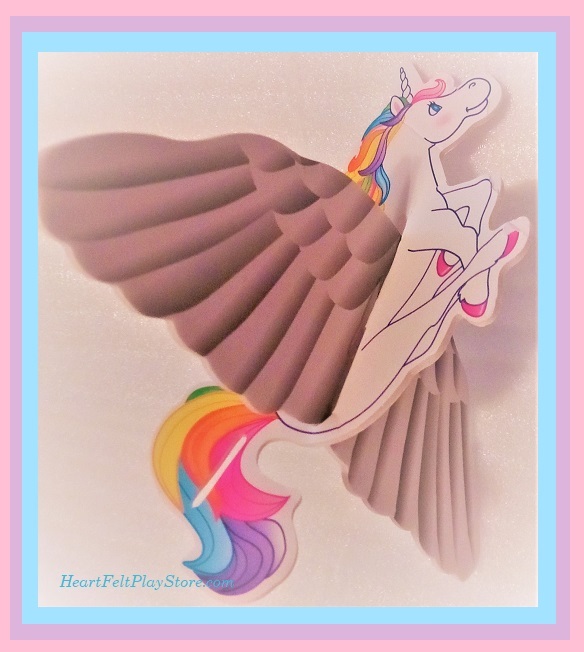 FREE shipping on this inflateable unicorn order. Malika Bourne the No Non-cents Nanna, author of this blog is the founder and owner of HeartFelt Play store.com Click HERE to view all of our current Unicorn inventory. Please note: inventory is limited. Order early or use our Wish List to receive a money-saving offer CODE in your email. Be sure to ask about our Plan Ahead Discount offers. Requires a minimum purchase, minimum quantities. Restrictions apply. Heart Felt Play Store may be small, but we are big on ideas and willing to help inspire creativity.